The printer’s proof for Bastion came in, and it looks great! It’s approved so the wait won’t be much longer. I’m very excited about this book, and I hope once you have it in your hands, I’m sure you will see that enthusiasm on every page. I’m especially proud of all the talented individual that worked so hard to make this happen. There is a very cool Kickstarter you should check out. Its very cool and if you enjoy Afrocentric RPGs this may be for you. 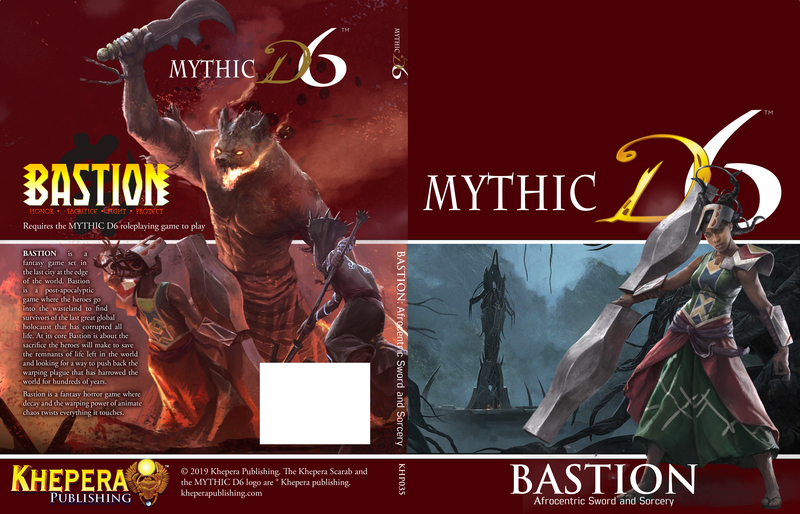 In honor of Black History month, the MYTHIC D6 supplement, Bastion, is Pay What You Want for the next two weeks. Steven Biko, Rosa Parks, Nzinga of Ndongo, Barack Obama, Nat Turner, Bobby Seale, Nelson Mandela, Prince, Mr. T, Nat Love, Chuck D., Malcolm X, James Baldwin, Peter Tosh, Bunny Wailer, Bob Marley, Huey Newton, Ava Duvernay, Mansa Musa, and My Mother. BASTION is a fantasy game set in the last city at the edge of the world. Bastion, a post-apocalyptic setting where the heroes explore the wasteland to find survivors of the final great global holocaust. At its core, Bastion is about the sacrifice the heroes will make to defend the remnants of life left in a world corrupted by a wasting plague harrowing the land. The cover for BASTION is locked in and done. Afrocentric sword and sorcery exist and Bastion is dripping with it. Still, a few odds and ends to be added inside and the book is done. BASTION: Only 24 hours left! Only 24 hours to the finish of the Bastion Kickstarter. A hundred-page, full color, hardback sourcebook for the MYTHIC D6 System. BASTION is a fantasy roleplaying game set in the last city at the edge of oblivion. A post-apocalyptic game where the heroes explore the wasteland to find survivors of the last great global holocaust that has corrupted all life. Bastion is an Afrocentric fantasy horror game where decay and the warping power of animated chaos corrupt everything it touches. BASTION Kickstarter: Am I Finished or am I Done? Everyone involved in the Kickstarter should be congratulated, and that includes the 232 backers that made it a reality. I’m not done yet. We have five days to go and that gives us time to add extra content to the book. My intent is not to do over the top stretch goals, only things that will enhance the existing text and add value to the generous monies you’ve already pledged. I want to include a Bastion style dungeon crawl in the book along with key locations. More maps, more art, more sword, and soul writing. More Art and 16 more pages of content. More content on the city of Bastion, plus an adventure that takes place under the city. More art and content on the world outside the walls of Bastion. There is a lot already, but we could add so much more. Create a version of Bastion that completely compatible with ATLANTIS: The Second Age and incorporate the game world into that milieu. Congratulate yourself on a job well done. Thank you. Please keep spreading the word and sending positive vibes. Brie Sheldon presented me with three question, and I mumbled through them. Brie is a talented creator with a ton of writing credits, and his Kickstarter called Turn, so please go check it out. The Bastion Kickstarter is moving along at a decent pace so far, but I would like your help in spreading the word. I know the internet is full of forums and media sites I’m not aware of, and that’s where you come in. Please find a place to post or share the Kickstarter. If you are generous to share the KS, please use the following phrase in the subject line or the title of the post. If you do make mention, let me know and I’ll pop up and explain the game. Every post, mention, like and share helps the campaign move toward the goal, and with your help, we can move it there quickly. The BASTION Kickstarter: Who are the Fihankra? The Fihankra are the greatest warriors that have ever treaded the dying land of Ife Oodaye. The sigil carved into the center of their foreheads resembles a slash of flame. The same fire glows within the pools of their eyes. Although this order was instrumental in preventing Lord Obonsam from scattering the last of the great races of Ife Oodaye, it is nonetheless feared. Even the great Akan king fears the power of this ancient order. Along with sacrificing their bodies, the Fihankra forsake many things, in favor of protecting Bastion from the remnants of Lord Obonsam’s army. They are also instrumental in preserving the populace from the ravages of the Gray Mist. The Doom Riders (as they are also known) continually venture forth into the depths of the Gray Waste. They search for survivors; they explore ancient ruins; and they hunt down prides of deformed beasts as well as the malingering dead. Many of the Fihankra fail to return from their lonely patrols. Sadly, some blame the Fihankra for the Gray Mist. They suggest that this ancient band of warriors brought forth the mist so that they could use it as a pretext to gain control of Bastion through fear and manipulation. All the great races can become Fihankra. The annals of this order include Akan, Tunannu, Rijal-Alhajar, Umbari, and Solari heroes. These individuals have shouldered the burden of this terrifying power and use it to serve Bastion. BASTION: Afro-Centric Sword and Sorcery fantasy Kickstarter is live! A full-length adventure set in the antediluvian world of ATLANTIS!